Shown here are Rock Hog's standard face designs. All heads up to 11" have (2) blow holes and (2) face flushing grooves. The number of carbide buttons will vary depending on the size and face style of the bit. Standard options such as larger, extra, or longer gauge buttons are available. Special face designs are available on a made-to-order basis. Contact your Rock Hog represenative for details. This is the most common face style used in the market today. The dish type face gives excellent penetration in medium and hard rock formations, while maintaining a straight hole. This face has excellent air flushing characteristics. 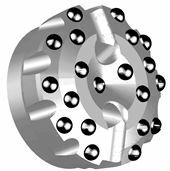 Concave is the predominate face style for the majority of drilling conditions. The flat face bit, as the name implies, is flat across the bit front. This bit is very aggressive in drilling applications and is suited best for very hard rock and in hard rock with broken formations. Used primarily in blast hole work, this bit tends to lead off in deep holes. 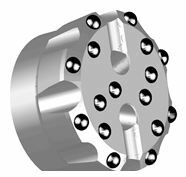 Rock Hog flat face bits come with standard face slots to aid in keeping the cutting face clean. This face has been utilized in very hard drilling formations where the face of the bit tends to be prematurely worn away. The convex style tends to keep the drilling face in tact longer by drilling with the two rows of buttons on the convex face. This face is a combination of convex / concave. It is recommended for abrasive formations in the hard rock and very hard rock range where other bit faces wear quickly. The kavex is designed to provide improved cleaning of cuttings thus reducing body wear. The concave center helps drill a straight hole.